Mention The Zombies and most people will cite their first hit single ‘She’s Not There’; the song that kicked off their career in classic fairy tale fashion. After they won a band competition in London enabling them to record a demo of it, ‘She’s Not There’ landed them a contract with Decca. The song became their debut release in 1964, making the top 20 in their native UK and No.2 on the US singles charts. Formed in 1961, the Zombies were led by singer Colin Blunstone and keyboardist Rod Argent. The majority of their material would be written by Argent or bassist Chris White. They were able to build on the international success of ‘She’s Not There’ with 1965’s smash hit ‘Tell Her No’. Unfortunately, the band would release a slew of singles throughout 1965 and 1966 but fail to break the Top 40 on either side of the pond. Their first album (“Begin Here” in UK and “The Zombies” in the US) was a hastily put together compilation to cash in on the popularity of their two big hits. After three years of non-stop touring, the group decided to break up in late 1966, having had no major chart success for nearly two years. However, White convinced his fellow band members to make a final album, signing with CBS after their Decca contract expired. The Zombies began recording what would become “Odessey and Oracle” in mid-1967 having the mindset that it would be their last. This freedom from expectation allowed the group to record whatever they desired. Arriving at Abbey Road Studios after the Beatles wrapped up “Sgt. Pepper…”, the Zombies had a tight budget and needed to work as effectively as they could. Nothing recorded could go unused, and they even relocated temporarily to Olympic Studios when Abbey Road was unavailable. Their final session was completed in November and the album’s artwork was done by White’s flatmate Terry Quirk, who failed to spell the word ‘odyssey’ correctly.The band decided to keep the title anyway, and split shortly before the record was released in April 1968. A masterpiece of baroque pop, “Odessey and Oracle” is full of catchy melodies and lush harmonies, with perhaps The Beach Boys being the only comparable contemporaries to achieve the same level of vocal brilliance. Opening track ‘Care of Cell 44’ is rich with harmony blocks and the upbeat feel created by Argent and drummer Hugh Grundy belies the sombre subject. The mournful ballad ‘A Rose for Emily’ is stripped down to just piano and vocals, with the latter building to act like a sweeping string section. Other highlights for me include ‘Beechwood Park’, ‘Hung Up on a Dream’ and ‘Brief Candles’. Although it’s all very listenable, some songs aren’t as engaging as others, particularly ‘Butcher’s Tale (Western Front 1914)’, which was bizarrely chosen to be the record’s first single. It wasn’t until CBS producer Al Kooper persuaded the label to issue the album’s last track ‘Time of the Season’ as a single in 1969 that “Odessey and Oracle” received any discernible acclaim. Released nearly two years after it was recorded, ‘Time of the Season’ would become the highest selling hit of the band’s career; it’s a shame they had already disbanded. The song has been a favourite of mine for many years, and I still name it as my favourite one here, despite it being the only track I had heard before spinning this record. ‘Care of Cell 44’ is a very close second though. Rod Argent formed his own band, simply called Argent, and would enjoy hits such as ‘Hold Your Head Up’ and ‘God Gave Rock ‘n’ Roll To You’ in the 1970’s. White was credited as writing or co-writing several songs for Argent without being an official member and Blunstone went to work in the insurance game. The popularity of “Odessey and Oracle” would slowly achieve cult status over the years and the band reformed in 2008 for a special 40th anniversary performance of the album in its entirety at the Shepherds Bush Empire in London. “Odessey and Oracle” was recently ranked at 100th place in Rolling Stone’s 500 Greatest Albums of all Time, showing that nearly a half a century later, its legacy is still growing. What a great album to end the year for the 60s! I put “Odessey and Oracle” having absolutely no idea what to expect. I vaguely recognised the cover art but that was about it. What came out of the speakers was pure baroque pop at its very best. I was instantly hooked from the first song and continued to be enthralled for the next 35 minutes. The Zombies present the album that I’ve been waiting for in afyccim. I had such high expectations for so many over the course of the 60s – I’m looking at you The Band, The Byrds, The Kinks and Love. “Odessey and Oracle” delivered all the expectations that those bands didn’t live up to. It’s concise pop that isn’t contrived or over thought. And my god I love a good keyboard solo and three part harmonies. I believe that The Zombies were only able to make this album because they knew they were about to split up and had nothing left to lose. They didn’t have to please a record label or an audience. They made an album to please themselves and that joy in what they are doing is evident in every song. Favourite tracks for me include ‘Care of Cell 44’, ‘A Rose For Emily’, ‘This Will Be Our Year’ and the strongest track and only successful single from the album ‘Time of the Season’. It’s evident that The Zombies wear their influences on their sleeve. The Beatles and The Beach Boys similarities in reference to The Zombies are justified. But to me it’s not so much an imitation as it is a homage to some brilliant music being made at the time. The album was a slow burner when released but it won my heart immediately, scraping into my top ten of the year. I don’t know why I’ve never paid much attention to The Zombies. This is the first time I’ve really listened to them, and I quite dig it! Curiously, Wikipedia has The Zombies’ genre (well, one of them anyway…) as “Sunshine Pop”, and I guess that’s pretty appropriate. It’s so happy! The easiest of listening. The Zombies came out of 60s England, and they adhere quite closely to the sound of the time. I think they sound very similar to The Kinks, which, after listening to “The Kinks Are The Village Green Preservation Society” earlier in the year, is definitely not a bad thing! ‘Care of Cell 44’ is definitely my favourite song from the album. A toe tapper right from the get go, it’s a ripper way to start the album. It certainly is a happy song, considering it’s about someone writing to their partner in prison… The vocal harmonies are so great they almost sound a little Beach Boysy. I’m not sure that ‘Butchers Tale’ is a great fit for “Odessey and Oracle”. It doesn’t really flow with the happy, upbeat feel of the rest of the album. It was released as a single, but it didn’t exactly sell well. Its B-Side was “This Will Be Our Year”, which would definitely have been a better single choice! The lead piano is very appealing to me, simple as it is, it drives the track along. When he says “You don’t have to worry, all your worry days are gone” even I believe him, 44 years later! With one day left of the year “Odessey and Oracle” has managed to slip in to my favourite albums of the year, by the skin of it’s teeth. Oh, and by the way, Zombies? Sure, you TOTALLY spelt Odyssey wrong on purpose. Uh huh. 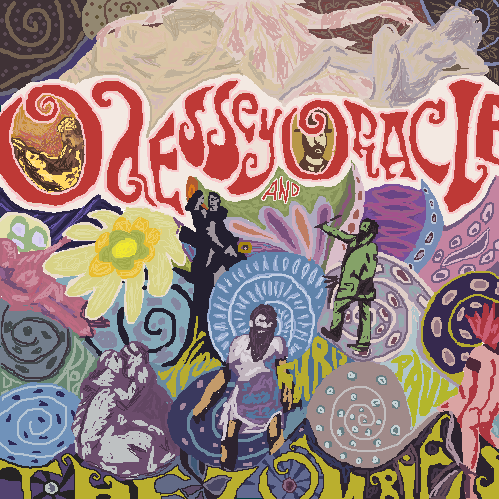 The first thing that I noticed about “Odessey and Oracle” was the striking psychelic cover art, which instantly betrayed the musical genre that would be contained within. Or did it? I was a little confused as I started listening, because “Oddessey and Oracle” is not entirely what I understand to be the full-blown psychedelic sound, especially when compared to other psych-pop albums of the 60’s (see the 60’s list). Despite the stark contrast between the cover and contents, “Odessey and Oracle” is a wonderfully-crafted collection of ditties. Ditties is an apt term in this case because unlike many other psychedelic albums, the songs on “Odessey and Oracle” are indeed remarkably short, all of them less than 4 minutes long (YES!). The songs feature lovely 2 and 3 part harmonies, and endearing synthesized string sections that were created using a curious device invented in the 60’s, the Mellotron (of which I had never heard until now). At times the vocals and the progressions reminded me of other bands we’ve covered throughout the 60’s that came before and after “Odessey and Oracle”, namely the Beach Boys, the Kinks, and the Beatles. I particularly rate the closing track of the album, ‘Time of the Season’, which features a catchy bassline which sounds similar in rhythm to that of ‘Stand By Me’ and a sweet- but- not- overly-DFN organ solo, the obligatory nod to psychedelia. “Odessey and Oracle” is a pleasant and interesting listen; although the songs are sweet and catchy, they have some intense themes under the surface. I wouldn’t say they were exactly memorable, which is probably why the album didn’t really sell that well originally, but they were catchy and easy on the ear. I just wish the stoner who did the cover art could spell properly!